“Do you want Catalonia to become a state? If yes, do you want this state to be independent?” This is the “inclusive” and “clear” question that the parties supporting Catalonia’s self-determination vote have agreed on this Thursday. The parties also agreed on holding the vote on November 9, 2014, “giving the Spanish institutions time to negotiate with the Catalan institutions within the legal frameworks, which are numerous”. 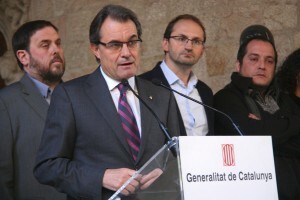 The agreement was explained by the President of the Catalan Government, Artur Mas, in a solemn appearance, joined by the leaders of the parliamentary groups supporting the vote. The question is “a compromise”, as “it allows voting for a change of the status quo” and “also allows voting on independence”. It is backed by 4 parliamentary groups, representing 64.5% of the Catalan Parliament’s seats. The agreement is now relying on being ratified by the supporting parties’ executive committees. After many weeks of debates and speculations, the parties supporting Catalonia’s right to self-determination and the organisation of a vote on this issue have finally reached an agreement on the vote’s exact question and date. The parties had given themselves until the end of December to reach such an agreement, however the political tension prompted them to speed up the process. The parties supporting the agreement are the Centre-Right Catalan Nationalist Coalition (CiU) – running the Catalan Government, the Left-Wing Catalan Independence Party (ERC), the Catalan Green Socialist and Communist Coalition (ICV-EUiA) and the radical left-wing and independence party CUP. This week, a series of discrete meetings have taken place and the President of the Catalan Government, Artur Mas, was personally involved in the negotiations. Mas briefly explained that the last round of negotiations had been “quick”, occurring in “just two days” and developed with much “discretion”. According to the Catalan President, the agreement is a “very good” one, as it covers the two main objectives the parties had ahead of them. Firstly, the question is “very inclusive” and is backed by “a wide majority”. Secondly, it is “a clear question”, which can be answered by ‘yes’ or ‘no’. Mas explained that in order to meet these two conditions, the question is split into two parts. 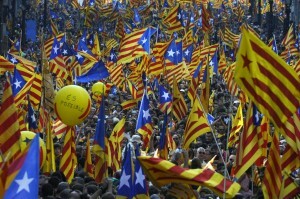 In addition, the Catalan President also announced they had also agreed on a specific date to hold the vote. 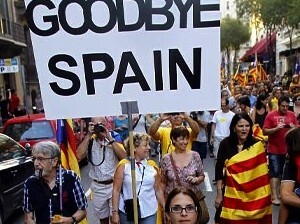 At this point, Mas announced the question: “Do you want Catalonia to become a state, yes or No? If yes, do you want this state to be independent, yes or no?” With this question, those who want to vote on Catalonia’s independence can do so, but those who only want to vote on changing the current status quo can also voice their opinion, he explained. Mas, also said he had wished the Catalan Socialist Party (PSC) had also joined the agreement. This party supports Catalonia’s right to self-determination but it is opposed to independence. A month ago it decided to withdraw from the negotiation on the exact question and date to hold such a vote, mostly pressured by the Spanish Socialist Party (PSOE), which it is part of. With the PSC, the self-determination vote would have been backed by 79.3% of the Catalan Parliament. The People’s Party (PP) – running the Spanish Government – and the anti-Catalan nationalism party Ciutadans (C’s) are absolutely opposed to holding such a vote and refuse any negotiation. These two Spanish nationalist parties represent 20.7% of the Catalan Parliament. In addition, Mas announced that the parties had agreed on holding the vote on the 9th of November 2014. He underlined that many parties had publicly “engaged in organising such a vote in 2014”. He explained that they had chosen the month of November “because it was the most convenient time for the success of the democratic process”. This way, “there will be time for the Spanish institutions to negotiate with the Catalan institutions within the legal frameworks, which are numerous”. Mas also added they had agreed on the legal procedure to hold the vote, but this would be announced at the Catalan Parliament. “Now we will wait for the answer of the Spanish State” he emphasised. Mas insisted on the many different ways the Catalans had expressed their will to freely and democratically vote on this issue. He said he was expecting the Spanish institutions “to listen to the democratic will of their citizens” in Catalonia. Finally, the Catalan President thanked the parties supporting the agreement for the “spirit of cooperation” and “their commitment to the country”. “We know what we have in our hands”, “we know it has a great historical transcendence and particularly a transcendence of the future” he concluded.